dusshera sort of snuck up on me, and before i realized it, the holiday was only a few weeks away. the culmination of nine days of celebration, dusshera is the largest festival that is celebrated in bangalore, which meant i was going to have one day off from work and a few additional days without center visits. 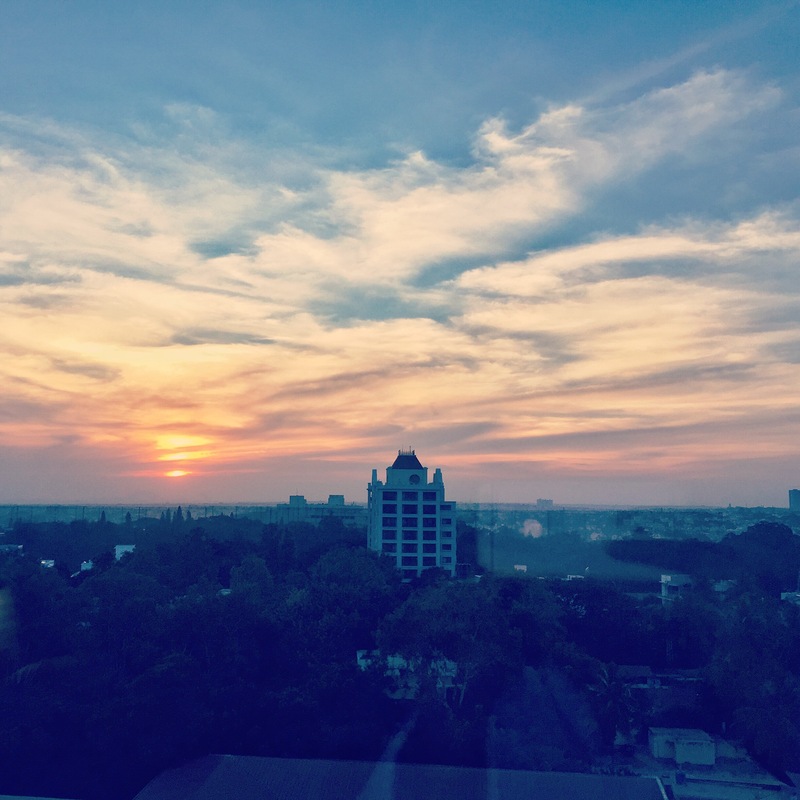 having just returned from my trip to sri lanka and lacking the energy or motivation to plan an out-of-town excursion, i decided instead to go for a staycation in bangalore. i knew if i stayed home i would spend the better part of 4 days watching netflix and eating junk [nothing wrong with it, but i do that often enough as it is], and this seemed like a better option to me. 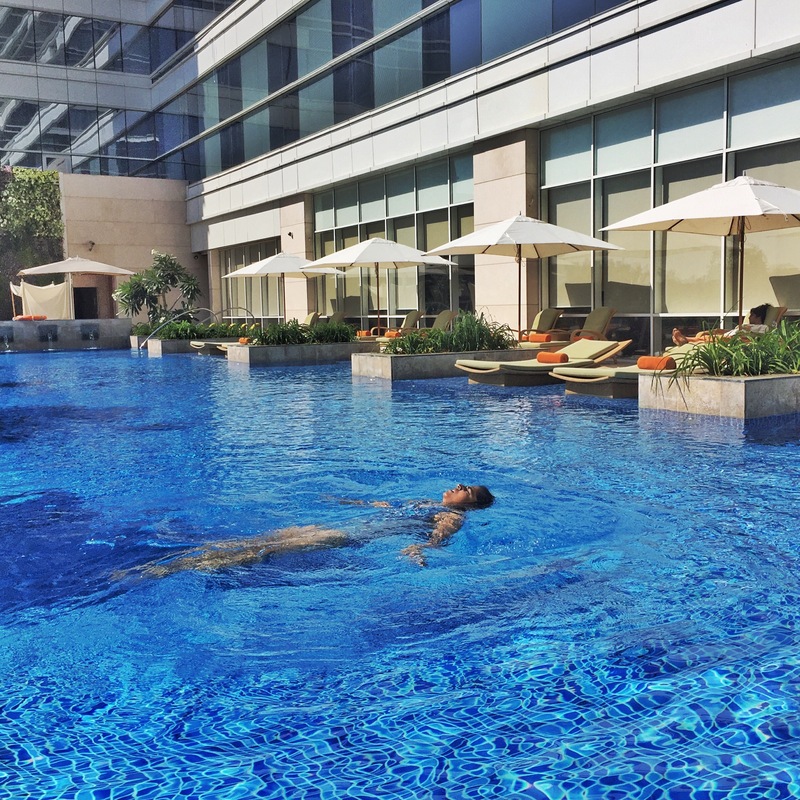 it’s something i have been toying with for a while, but the combination of a light workload, a newly opened 5-star hotel with discounted rates, and the opportunity to escape the heat with air conditioning and a swimming pool made it a no-brainer. beautiful pool all to ourselves. bangalore, india. 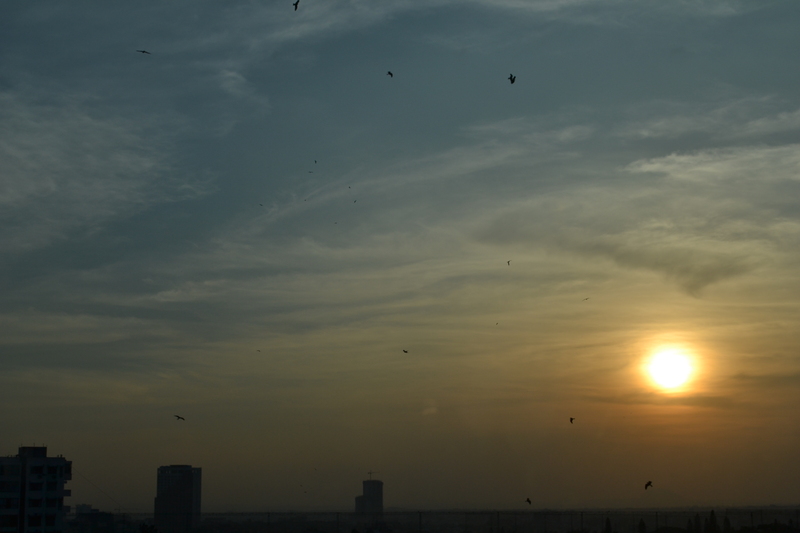 october 2015.
sunset view. bangalore, india. 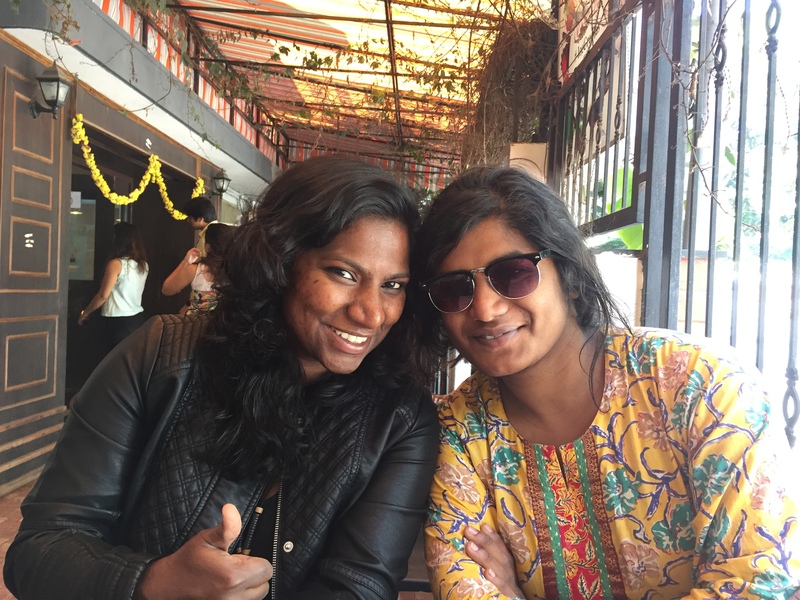 october 2015.
i invited shonali to stay with me, and when she said she would be out of town for the friday, i invited sneha for the first night. shon ended up coming back earlier than expected from her trip, so they both kept me company for the first night, with shonu staying on for saturday as well. walking into the room. bangalore, india. october 2015.
when shonali and i arrived at the hotel on friday afternoon, we were blown away by the opulence of the lobby. shangri-la opened at the end of september, so everything was still bright and shiny and brand new when we stayed, and every surface gleamed. bathroom. bangalore, india. october 2015.
we were greeted by smiling staff at every turn and led to the reception desk, jaws hanging open. before i could even gather my thoughts, the receptionist was checking us in, the guest relations manager was introducing herself to us, and another staff member was performing a small puja to welcome us [it was dusshera, after all]. 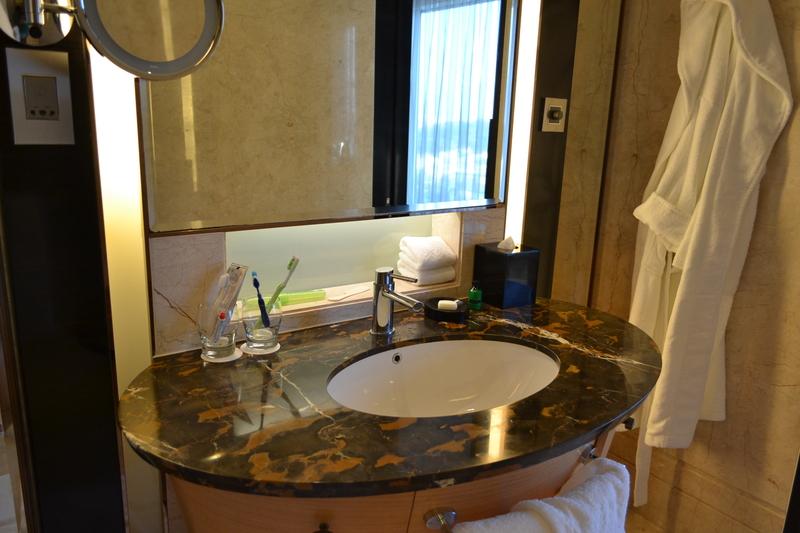 vanity area. bangalore, india. october 2015.
once we were checked in, we were ushered up to our room on the 9th floor. 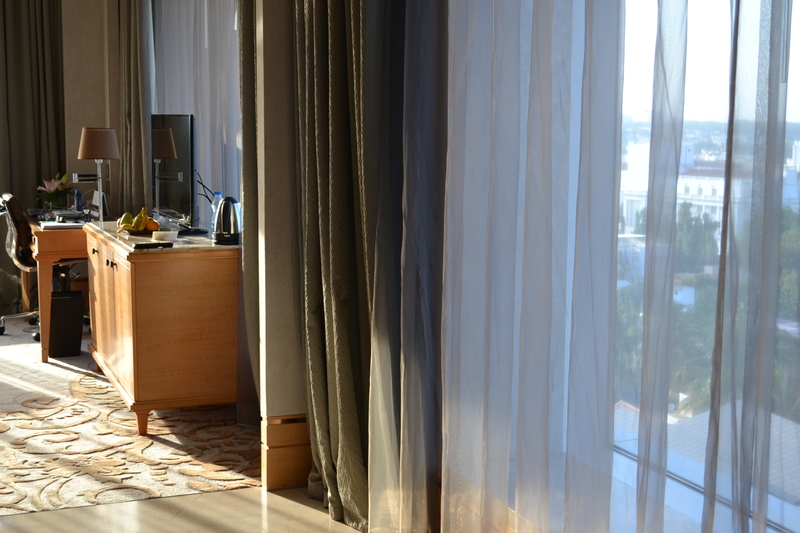 i had requested one of their panorama view rooms, and we had gorgeous views of the city from our vantage point. 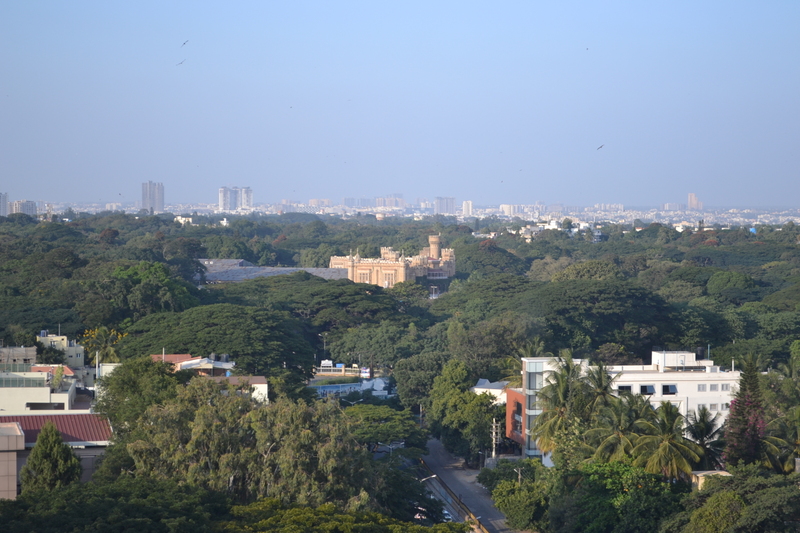 it took us a few moments to get our bearings, but we eventually realized that we were looking out over mount carmel college toward the palace on one side and toward malleshwaram and yelahanka on the other. a view of the palace! bangalore, india. 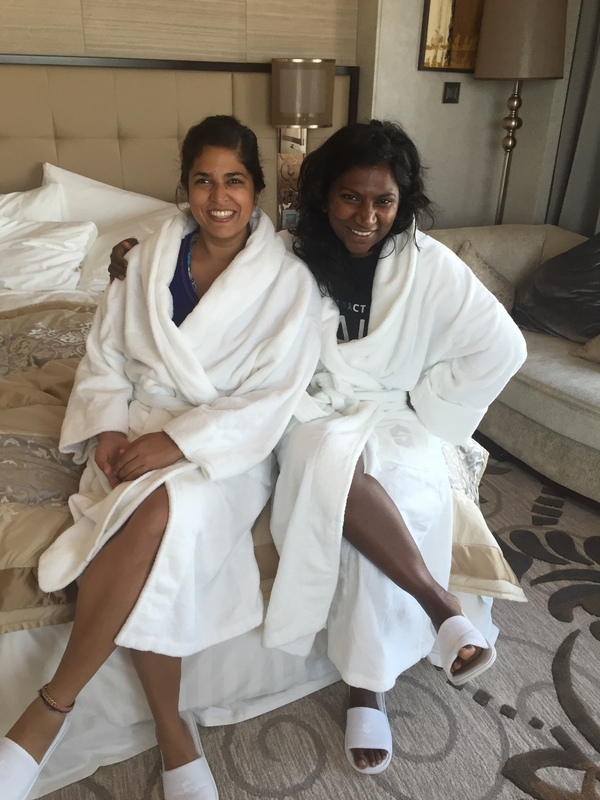 october 2015.
i wasted no time bundling myself into the robe and slippers that were kept in the room, and then shonali and i took advantage of the in-room wifi to complete our work for the afternoon while we simultaneously explored all the amenities that were on offer. desk covered in all my crap. bangalore, india. october 2015.
sneha joined us after she finished work, so we spent some time showing her around and watching the sun set behind the golf course while we plotted our escapades for the weekend. first and foremost on our list was a visit to the pool. bed and seating area. bangalore, india. october 2015.
when we woke up on saturday morning, sneha and i donned our swimsuits and the three of us set off for the pool. 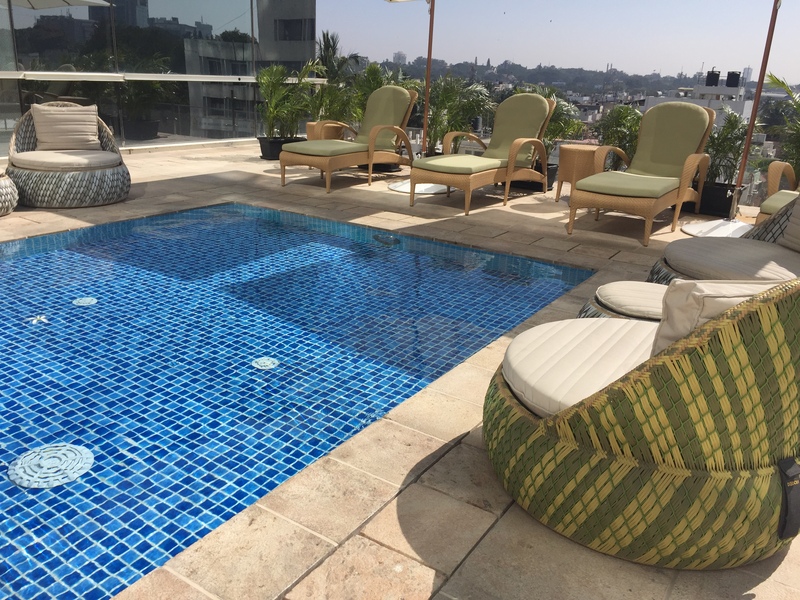 the pool, health center, and spa are all located on the third floor of the hotel, so the pool is private and also offers a slight view of vasanthnagar and benson town. i wasted no time hopping in, and the water was so cool and refreshing that i could have stayed in it all day. sneha soon joined me, and we spent some time lazily swimming laps and floating and reveling in the fanciness while shonu read on one of the many lounge chairs set up around the pool and baby pool. i did the same for a bit until it became too hot to sit outside any longer. baby pool and lounge area. bangalore, india. october 2015.
after a delicious breakfast around the corner at desserted, sneha left for home and shonali and i went back to the room. we had big plans to do work, read, write postcards [me], and watch the latest episodes of modern family [shon], but we both ended up taking long, luxurious naps instead. 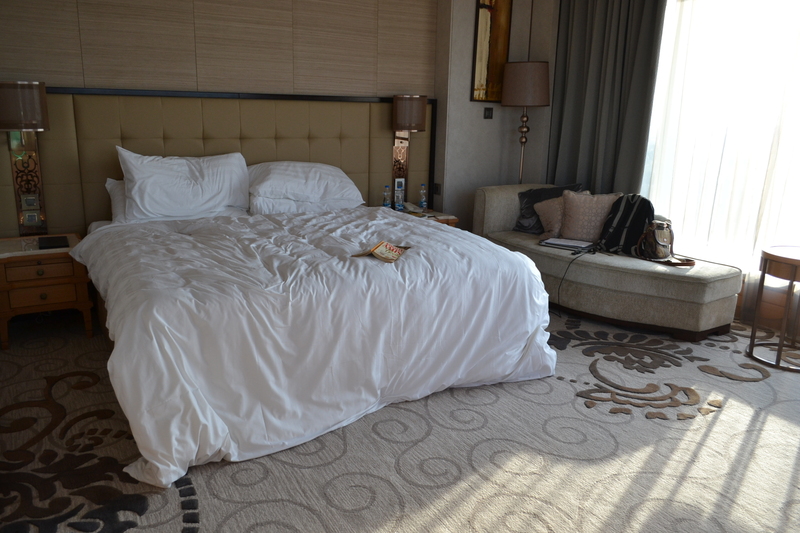 the bed was so comfortable, and i just couldn’t help falling straight to sleep. huge comfortable bed. bangalore, india. october 2015.
when i woke up from my nap it was time to check out the shower. even though it wasn’t a rain shower head – i’m rather obsessed with them – it was still a pretty great shower. it was so nice to have such a steady stream of hot water, and i could have stayed in there forever. i took advantage of the free toiletries on hand, and i liked them so much i walked away with whatever was remaining. 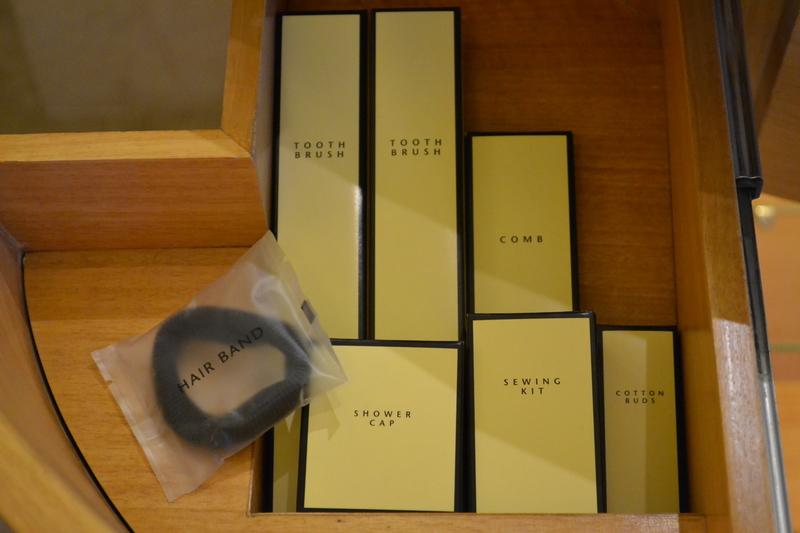 complimentary toiletries. bangalore, india. october 2015.
we headed out for a play and drinks in the evening, returning only around 1am. we both crashed pretty quickly, and although we had big plans to get up for a swim in the morning, it was far too tempting to enjoy the comforts of that giant bed and sleep in. i would have loved another go in that pool, but i am not upset that i took advantage of a few extra hours of sleep. the view from the bed. bangalore, india. october 2015.
shonali had to head out pretty early, but i lounged in the bed a little longer before showering, gathering my things, and proceeding to check out. normally check-out is at 12pm, but i asked for a 1pm check-out instead, and that extra hour made a huge difference. 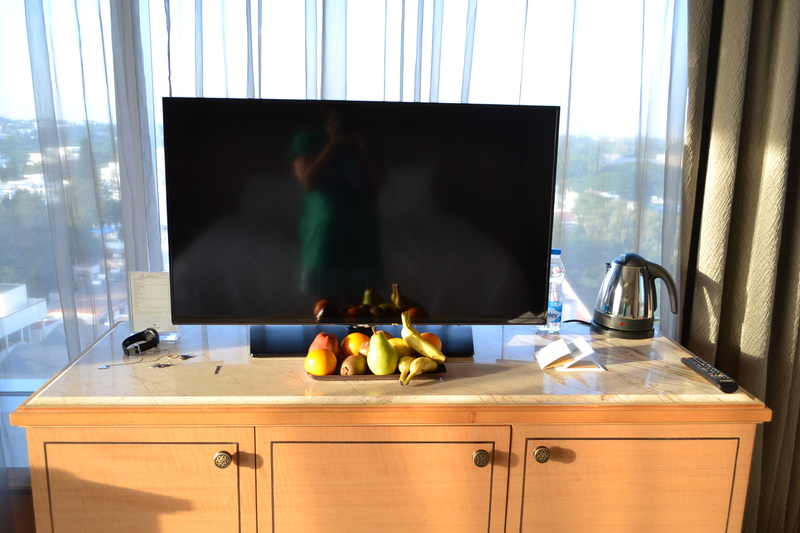 entertainment center, mini bar, and complimentary fruits. bangalore, india. october 2015.
overall i enjoyed my stay. it was nice to pamper myself for a few days and be able to completely forget about work [i didn’t even switch on my laptop on saturday!]. a few days of complete disconnection was exactly what i needed, and shangri-la afforded me that luxury. i would have enjoyed spending more time actually in the room, but i had a fun weekend so i won’t complain. kites at play. bangalore, india. october 2015.
the bottom line: it was a great stay for the discounted price, but i’m not sure it’s worth the full rate. 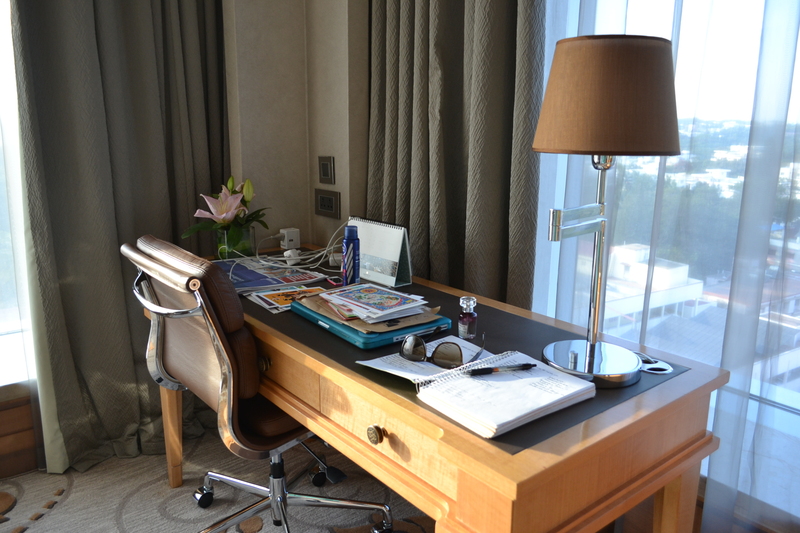 there are hotels that are just as nice for a third of the price and with better access to the city center. but it was perfect for what i wanted out of my staycation. desk and entertainment center. bangalore, india. 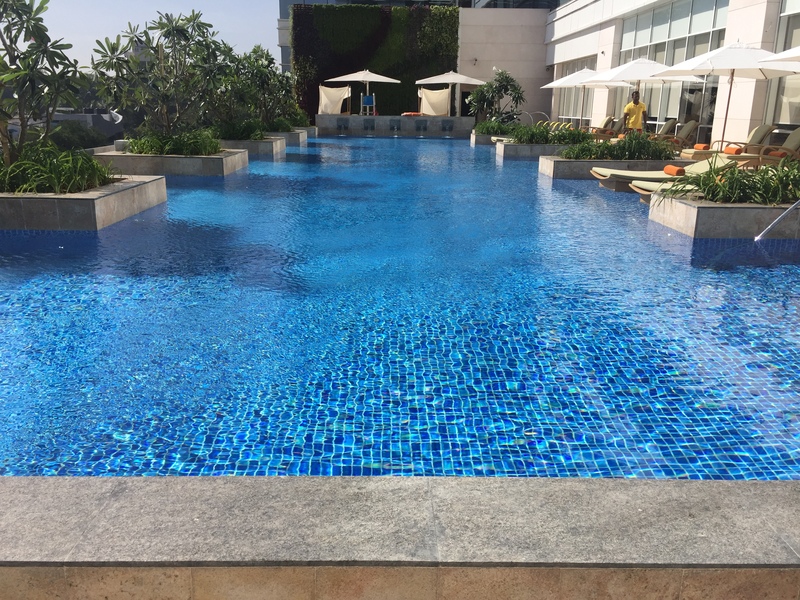 october 2015.
the pool. it was seriously amazing. it’s perched on a third-floor overlook, so it’s nice and private. the view isn’t great – would have been better from the sixth floor, probably – but it’s worth it to be above the traffic and just to relax. we had the entire pool to ourselves during our visit, and i really could have stayed in it all day if it hadn’t gotten so hot in the middle of the day. there are lots of lounge chairs, including a few in the pool, and umbrellas all around for those who want shade. the stay was worth it for the pool alone. the shower. as someone who lives on bucket baths and the occasional very measly shower, i am always amazed when i stay in a hotel with a strong shower. i am all about the water pressure, and shangri-la’s shower had it. i will admit to being slightly disappointed that they didn’t have a rainfall shower head, but i got over it pretty quickly. the service. i guess that’s one of the main things you pay for at a 5-star, isn’t it? everyone there bent over backward to help us during our stay, and they responded to every query and request promptly and genuinely. from the greeters to the reception staff to everyone in the b cafe, i was treated with the utmost respect and friendliness. and when you’re a group of young women who clearly don’t spend a lot of time in places like this, that goes a long way. they’re paperless! sort of. when i checked in there was no paperwork to fill out; instead, the form came up on a tablet screen, and i simply had to sign on that. the receptionist made it a point to mention that they are paperless, which i appreciated. but then when i checked out i was still handed a paper receipt. kudos to them for cutting back on the amounts of paper i usually end up with after a hotel stay in india, but i would have liked the option to have the receipt emailed to me rather than printed out. the wifi wasn’t great. i know it’s a luxury, but i expect reliable wifi when i stay in such a nice hotel. it wasn’t even at half capacity when we stayed, and still the wifi was quite slow and stalled out quite a bit. i hoped for better, and i also hope maybe they are still just working out some kinks. the lighting was complicated. i’ve become used to hotels that have consoles on a bedside table from where you can control all the lights in the room. it’s easy-to-use, and each light is clearly labelled, so you know exactly what you are switching on or off. the switches in shangri-la were super fancy, but it took us most of that first evening to figure out which switches controlled which lights. we had a few issues with the key cards. the issues were sorted very quickly by the front desk, but we did have times when one of our key cards wouldn’t work for the room. i don’t know if they got deactivated on accident, or if they got de-magnetized from being kept next to a phone, but it was unexpected. breakfast wasn’t included in the room rate. call me whatever you like, but i am of the mind that breakfast should always be included, especially if you are staying in a 5-star hotel. it doesn’t have to be fancy, but at least some cereal and bread and maybe some fresh fruit. if i’m paying that much money, i feel like i should get some breakfast. it was going to cost rs. 3,000 extra per day to include breakfast in my plan, so i passed. that was a bit of a disappointment. location: no 56-6b, palace road. abshot layout, vasanthnagar. bangalore – 560052.
landmark: next to mount carmel college. dates stayed: 23-25 october 2015.
room rates: i paid rs. 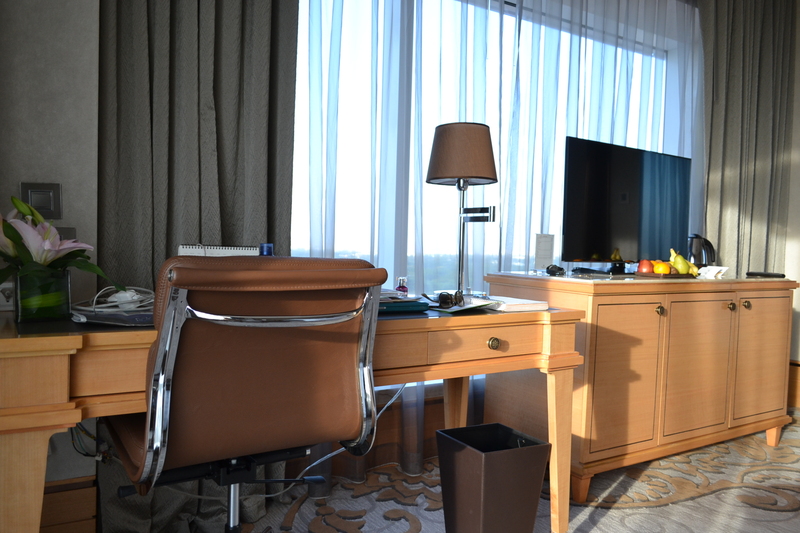 8,500 plus taxes per night for my panoramic view room [plus an extra rs. 1,500 on friday because we had a third person]. regular rooms started at rs. 7,500, and city view rooms were rs. 8,000. please note that all current prices are half their regular rate as a welcome offer since it is a newly opened property. minimum rates will soon be rs. 15,000 plus taxes per night. amenities: in-room wifi [which was only ok for a 5-star]; unlimited tea and coffee; sofa; desk and chair; separate bidet and shower; toiletries; bathrobes and slippers; iron and ironing board; hair drier; dental kit, comb, etc. [including hair bands and ear buds! ]; unlimited bottled drinking water. to keep in mind: certain packages – such as ours – do not include breakfast; to include breakfast would have increased my price by rs. 3,000 per night, so i opted out // the higher floors of the hotel are still being finished, which is why i think the rates are still at half price // i’ve heard the chinese restaurant on the third floor is supposed to be good. 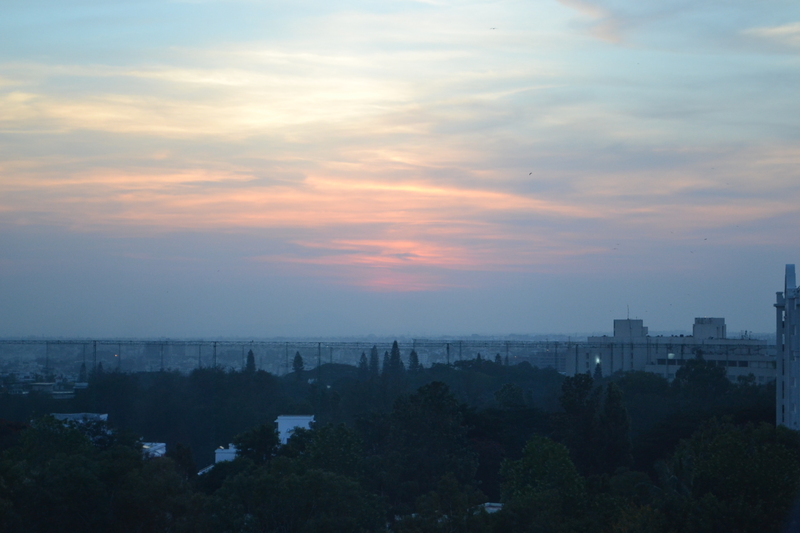 my tripadvisor rating: 4 out of 5 // currently ranked #22 of 594 hotels in bangalore. 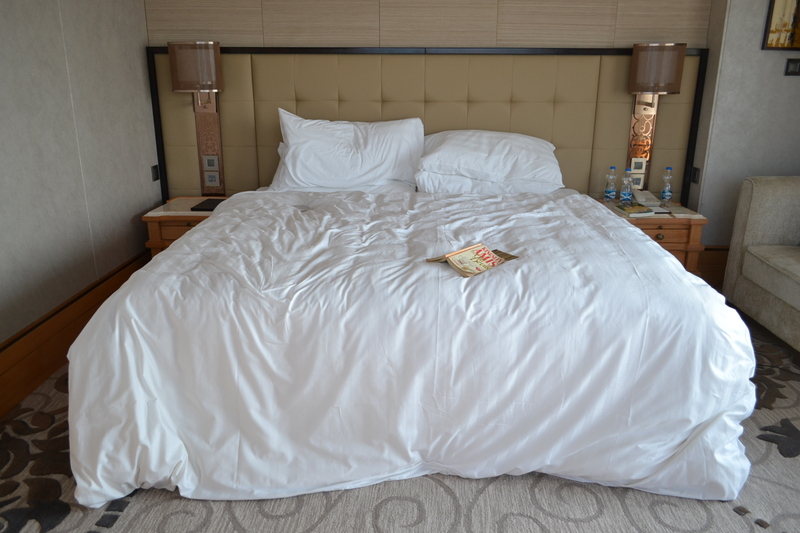 would i stay there – or in a partner hotel – again? maybe. for the rate i paid the stay was really nice, but i wouldn’t pay rs. 17,000 a night for the room. 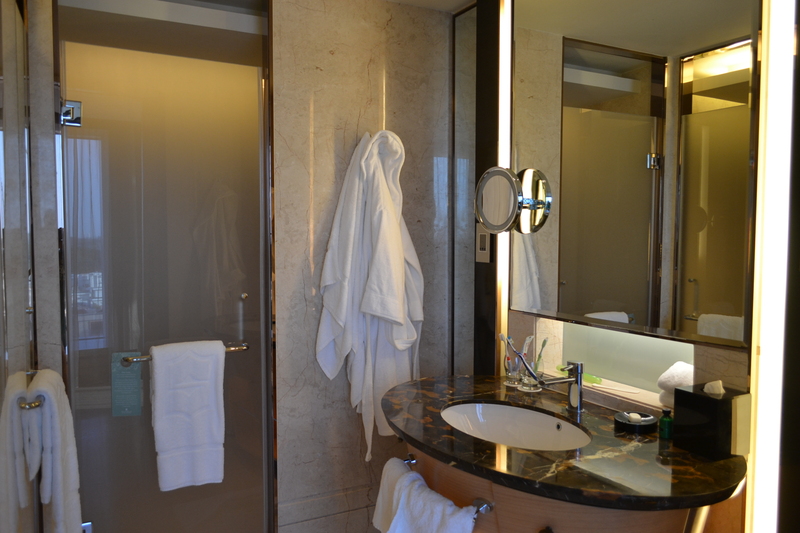 for my money, st mark’s is still the best hotel in bangalore [even tripadvisor agrees with me — it’s ranked #2 on there]. 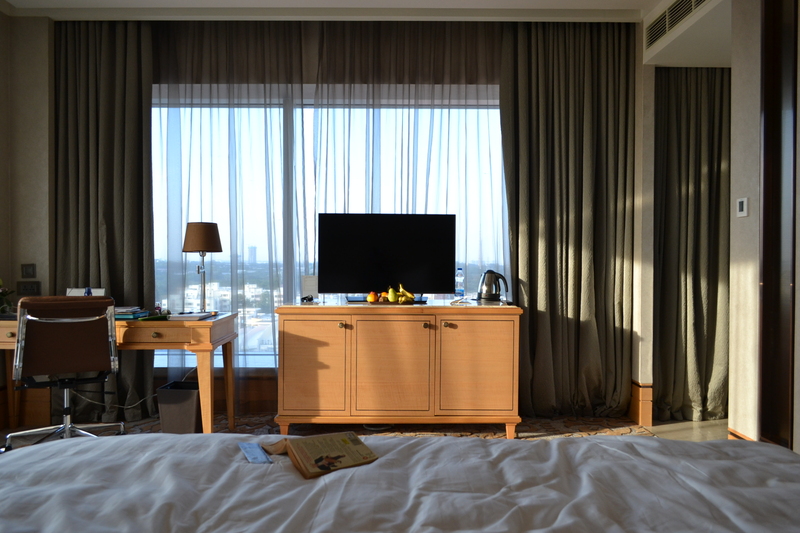 have you ever treated yourself to a night in a 5-star? how has your experience been?